Amanda Bechtel was the best musician in the Concord band. Ever since the sixth grade she had practiced like a professional, and her dedication over time had lifted her higher than those around her. Director Max Jones built the risky beginning to the 2004 show around a lengthy flute solo. Listen to Amanda play "Gabriel's Oboe"
“For the first time in six years, she hadn’t practiced her flute. Instead, she talked and prayed, sometimes all night, with the others on the trip. She sensed a new identity emerging, beyond her music. ‘That’s who I am,’ she confessed in one of the late-night prayer sessions. ‘Hi, I’m Amanda Bechtel. 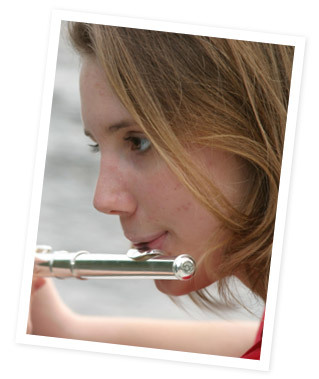 I play the flute.’ But everything that mattered most in her life now led her to Israel. She wore the Star of David as a talisman of her new identity and a reminder of her commitment to return. No one around Concord was likely to mistake her for a Jew—as far as she knew, there wasn’t a single Jewish student among the 1,400 students at the high school. Those who noticed her necklace understood it, correctly, as a symbol of her devotion to bringing about a Christian heaven on earth.